I strongly urge all people interested in stopping the anti-gay violence in Jamaica to see Taboo Yardies, a film-short on the issue. It will be shown at 6 p.m. April 24 at the General Theological Seminary, 440 W. 21st Street, in New York. I saw a preview of the movie and I highly recommend it. Filmmaker Selena Blake (pictured left) offers an in-depth, multi-layered snapshot of the problem. 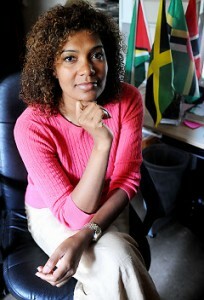 She is a heterosexual Jamaican woman who explores the roots of the homophobia and what it means for Jamaican society. For additional information about the movie, visit www.tabooyardies.com.